Lincoln Elementary Schools welcomes their families into their building and classrooms every day but is focusing this year on creating events at each grade level that involve families in fun, learning activities. All grade levels at Lincoln School have offered a literacy-based event for parents and families this year. Most events have focused on ways to encourage reading. For example, second grade focused on comprehension skills such as sequencing and fourth grade focused on fluency. Third grade classrooms have been sending home weekly “Owl Packets” that are targeted to a child’s reading level. Students have one week to read the text and write answers to multi-choice questions with the help of their families. Students are given a reading that parents time them each night to see how they improve. To kick-off the “Owl Packets,” the teachers held a family event to create owl magnets. But before the creative activity, they instructed parents on how to do the fluency-timed passage, showed written answers for a text that students would read with their parents at home and how to score the samples together. The teachers used an app, Plickers, to register their answers on an iPad. Families had a card with unique QR code and their confidential answers were displayed on a screen. Parents loved the game and learned how writing is scored so they can help their child at home. At each grade-level family event, the teachers prepare something for the families to take home to practice the skills they have learned. 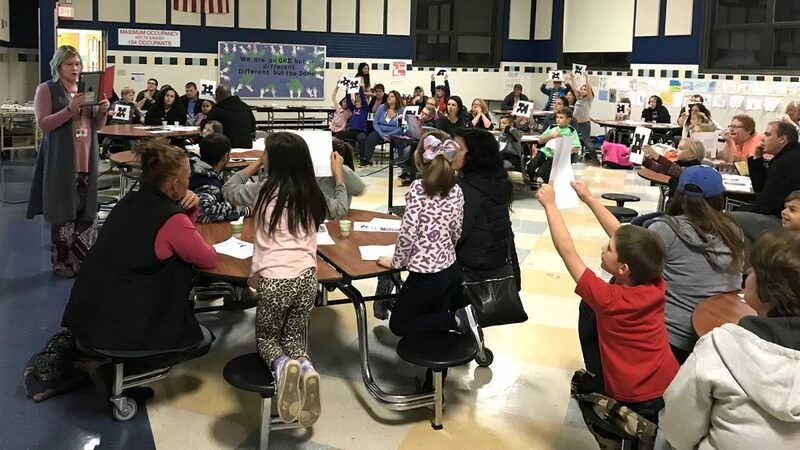 In addition to the grade-level events, the reading teachers at Lincoln School will be holding a literacy night with stations for all Lincoln families to work with their children to develop their reading and writing skills.